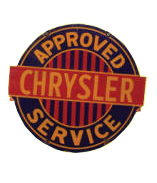 This old vintage service station sign advertises Chrysler service. The sign is circular with blue and red coloring. A bar across the center of the sign reads “Chrysler” in yellow letters against a red background. Around the perimeter of the circle is “Approved Service.” Striped red and blue lines decorates the middle of the circle.